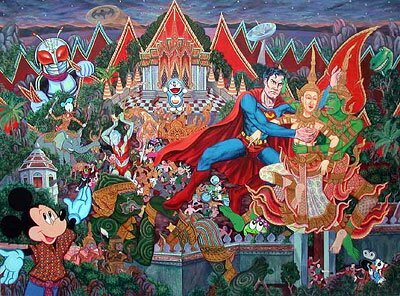 The remarkable thing about the Thai version of this epic is that the “heroes” and “villains” aren’t always particularly heroic or evil. Rama’s treatment of Sita after her abduction by Totsogan is often viewed as very unbecoming of a hero, and some of Totsogan’s portrayal almost makes him a tragic heroic figure (in that Western dramatic sense). Not that figures in many European/Western epics are portrayed unambiguously, of course, but the clear delineation between “good” and “evil” isn’t as pronounced in the Thai version of the epic. I’m not sure if that applies as much to the original Indian version (or versions) of the story.